Lok Sabha elections 2019 HIGHLIGHTS: BJP slammed Rahul Gandhi's minimum income guarantee. Former Union minister Sukh Ram, grandson Aashray Sharma joined Congress. Milind Deora replaced Sanjay Nirupam as Mumbai Regional Congress Committee chief. Lok Sabha elections 2019 HIGHLIGHTS: In a major change the Congress on Monday appointed former union minister Milind Deora as Mumbai Regional Congress Committee chief, replacing Sanjay Nirupam. Nirupam had been at loggerheads with senior party leaders in the state and the move has come as a bid to quell the intense infighting within the Mumbai Congress, PTI reported. In another development, Former Union telecom minister Sukh Ram and his grandson Aashray Sharma, rejoined the party Monday. Congress president Rahul Gandhi Monday said nearly 25 crore poor people in the country will get financial assistance of Rs 72,000 per annum if the party is voted to power. His statement, however, was slammed by BJP in a press conference later as Union Finance Minister Arun Jaitley calling it a “bluff announcement”. Meanwhile, the deadline for filing of nominations for the first phase of Lok Sabha elections ends Monday. On April 11, 91 constituencies across 20 states and union territories will go to polls in the first phase. The last date of withdrawal of candidature is March 28. Monday is also the last day of filing nominations for all 175 Assembly constituencies of Andhra Pradesh, 28 seats in Odisha, all 32 seats in Sikkim and all 60 assembly constituencies in Arunachal Pradesh. Election activity in the country gears up as political parities hustle to file nominations for the first phase of elections Monday. Follow LIVE Updates here. BJP leader Arun Jaitley Monday slammed Rahul Gandhi's promise of giving Rs 72,000 per year to the poorest families as a "bluff announcement" and yet another Congress bid to "cheat" the poor, and asserted the Modi government was already giving one-and-a-half times more money to them. The Finance Minister told reporters here that the Congress has a history of cheating the poor and misleading the country in the name of removing poverty as it only gave them slogans but not the tools and resources, PTI reported. "Merely slogans and statements will not remove poverty. It will go by providing resources which the Modi government has by giving the poor houses, gas connections, roads... You (Congress) have cheated the poor many times and are trying to do so again. But people will not fall in trap this time," he said. Earlier in the day, Congress president Gandhi promised that the 20 per cent poorest families will be given Rs 72,000 annually as a minimum income if his party is voted to power in the Lok Sabha polls. After being appointed the president of Mumbai Regional Congress Committee, Union Minister Milind Deora thanked Sonia Gandhi and party president Rahul Gandhi. "Mumbai is a city of diversity, we'll take everyone together; present a positive agenda to Mumbaikars," he was quoted as saying by ANI. BJP Central Election Committee meeting is underway at the party headquarters in New Delhi. The BJP on Monday reacted sharply over Congress President Rahul Gandhi's Minimum Income Scheme. He said the Congress has resorted to such polls gimmicks since the time of Indira Gandhi. Addressing a press conference, senior BJP leader and Union Finance Minister Arun Jaitley called it a "bluff announcement". Union Minister Ravi Shankar Prasad on Monday made light of Congress Chief Rahul Gandhi's announcement of Minimum Income Guarantee Scheme. "Indira Gandhi had raised slogan of 'Gareebi Hatao' in 1971. We thought poverty had been removed but nothing happened. Rajiv Gandhi was PM, he said I send Re 1 from Delhi and only 15 paise reaches villages," the law minister was quoted as saying by PTI. "This showing of false dream to the people of India, is not going to cut any ice because the Congress record of 55 years has always been anti-poor," he added. A Congress delegation comprising Randeep Singh Surjewala, Kapil Sibal, and Abhishek Manu Singhvi on Monday met Election Commission of India over the biopic of Prime Minister Narendra Modi. After the meeting, Sibal said the purpose of the movie is political since it is beibg launched just a few days ahead of the elections. Karnataka's ruling coalition partner Janata Dal-Secular (JD-S) supremo H D Deve Gowda, who filed nomination from Tumkur Lok Sabha constituency today, said he didn't want to contest the elections as he worked as Lok Sabha MP for 29 yrs. "Farooq Abdullah, Mamata Banerjee, Ghulam Nabi Azad & many leaders, including my friends, suggested me to contest," he told ANI. "I know when we took this decision it might have hurt the sitting MP from Tumkur SP Muddahanumegowda. I don't want to hurt him, Congress leaders conveyed everything to him...I chose to contest from Tumkur on the demand of many Congress and JD(S) leaders," he said. "Congress gave CM seat to us even when we won 37 seats," Gowda said while referring to the Congress-JD(S) coalition in Karnataka. "With support of Rahul Gandhi & Sonia Gandhi we formed govt here. I'll campaign everywhere in state. I'll also go to Andhra, Chandrababu Naidu also invited me. We're secular parties, wherever required I'll go," he said. Former prime minister and JD(S) president H D Deve Gowda and his grandson Nikhil Kumaraswamy have filed their nominations from Tumkur and Mandya Lok Sabha constituencies respectively. Earlier in the day, two Congress leaders filed their nominations for the Tumkur Lok Sabha constituency — the seat from where Deve Gowda is contesting. Congress leaders KN Rajanna and SP Muddahanumegowda defied the pre-poll understanding between the ruling alliance partners in Karnataka. While the JDS announced Gowda’s name as the joint candidate, Rajanna and Muddahanumegowda rebelled against the move. Tumkur will vote on April 18. Karnataka Deputy Chief Minister G Parameshwara on Monday said that it's a historical day as former state chief minister, who made Kannadigas proud, is contesting Lok Sabha elections from Tumkur. Paralympian Deepa Malik, who joined the BJP on Monday, said that she appreciates the work done by the Modi government for women empowerment. She said the PM has put women in leading portfolios and has also worked extensively for the divyangs (disabled). After meeting West Bengal CM and TMC supremo Mamata Banerjee, Makkal Needhi Maiam chief kamal Haasan said the interaction was excellent. "We are proud to say that Makkal Needhi Maiam is an ally of TMC in Andaman. We hope this relation evolves in future. I'm going to campaign for their candidate (in Andaman)," Haasan was quoted as saying by ANI. Odisha Chief Minister and BJD Chief Naveen Patnaik on Monday filed nomination for the Bijepur assembly constituency at the Padampur Sub Collector office in Bargarh. He had earlier filed his nomination for the Hinjili assembly constituency as well, reports ANI. Makkal Needhi Maiam chief Kamal Haasan on Monday met West Bengal Chief Minister and TMC chief Mamata Banerjee at Nabanna in Howrah. Putting all speculations to rest, Makkal Needhi Maiam (MNM) president Haasan on Sunday had said he won’t be contesting upcoming Lok Sabha elections. Haasan also announced the second list of 19 candidates who will be contesting on the ‘Torch Light’ symbol. Last week, MNM released its first list of 21 candidates for Tamil Nadu and Puducherry for Lok Sabha elections. The Nationalist Congress Party (NCP) on Monday released its election manifesto for the Lok Sabha Polls. NCP leader DP Tripathi, on the party's election manifesto said: "Road to dialogues should never be closed. It's necessary to strengthen our stand in global circumstances. So we said road to dialogue should stay open.I don't say dialogues will immediately resolve situation but it'll lessen problems." A Congress delegation comprising Randeep Singh Surjewala, Kapil Sibal, and Abhishek Manu Singhvi to meet Election Commission of India over the biopic of Prime Minister Narendra Modi later today, reports ANI. 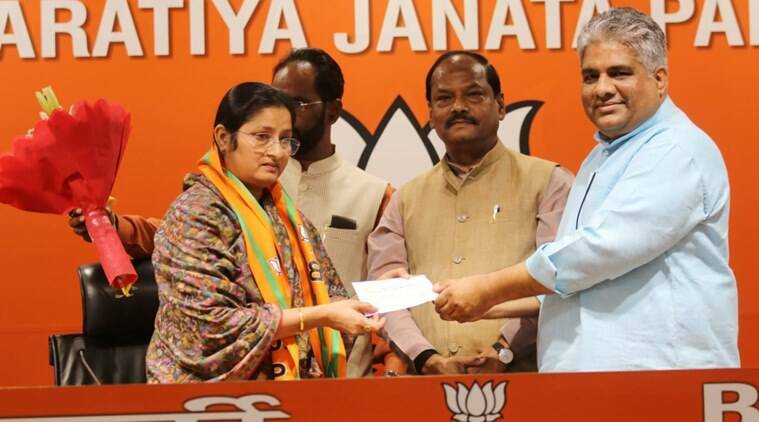 The BJP Monday named party's state vice-president Pitamber Acharya as its candidate against ruling BJD president and Chief Minister Naveen Patnaik, who is seeking re-election from Hinjili assembly seat in Odisha's Ganjam district, party sources were quoted as saying by PTI. Acharya, a senior advocate of Orissa High Court, is also the BJP's spokesman. He was assigned the responsibility of the party's vice-president barely two days ago. The BJP is yet to name its candidate against Patnaik in Bijepur assembly seat from where the BJD president will also contest. Former Union telecom minister Sukh Ram and his grandson Aashray Sharma on Monday joined the Congress, AICC in-charge for Himachal Pradesh Rajni Patil said. Sukh Ram and Aashray Sharma met Congress president Rahul Gandhi and joined the Congress. A formal announcement will be made shortly at a press conference, Patil told PTI. Aashray Sharma, son of cabinet minister Anil Sharma in the Jai Ram Thakur-led BJP government in Himachal Pradesh, seeks to contest from Mandi parliamentary seat. He quit the BJP after the saffron party renominated its sitting MP Ramswaroop Sharma from Mandi. Aashray's father Anil Sharma had been a part of Virbhadra Singh-led Congress government in the state from 2012-17, but joined the BJP before the last state assembly elections. The latest development has put Anil Sharma in a spot. The BJP on Monday got a shot in the arm as Paralympics Games winner Deepa Malik joined the party, along with INLD MLA Kehar Singh Rawat. Deepa hails from Haryana. 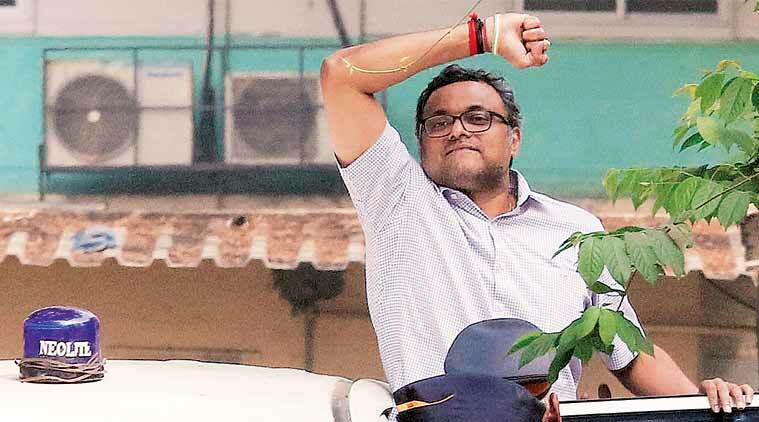 Former finance minister P Chidambaram's son Karti Chidambaram on Monday filed nomination for the Sivaganga parliamentary constituency as the Congress candidate. Sitting BJP MP from Mathura Hema Malini on Monday filed nomination from the Lok Sabha constituency as BJP candidate for LS Polls. Before filing the nomination today, she offered prayers at Banke Bihari temple with Uttar Pradesh Chief Minister Yogi Adityanath. The Nationalist Congress Party (NCP) on Monday released a list of star campaigners for Lok Sabha elections for Maharashtra. Sharad Pawar, Praful Patel and Supriya Sule feature on the list. UP BJP has expelled party leader IP Singh for six years, reportedly over anti-party activities. Congress candidate from Sivaganga Karti Chidambaram yesterday said that every frontal organisation of the Congress and the alliance parties fully support his candidature. He also said that he has worked in 10 general elections and the public knows him very well. Reacting to Rahul Gandhi's promise of giving the poor Rs 72,000 per annum under the minimum income support scheme, BJP leader Ram Madhav said if the Congress leader is so sure about his defeat, he can promise moon. "If you are sure about your defeat, you can promise moon. Who takes it seriously? Already under different schemes poor families get much more support. Is it in addition to those schemes or they all will be subsumed in it?" Madhav said on Twitter. Rahul Gandhi: We have studied fiscal implications of the scheme. Final assault on poverty has begun. Speaking about his minimum income support scheme, Rahul Gandhi said it is an extremely powerful, ground-breaking and well-thought through idea. The Congress president said that the party has consulted many economists on the scheme. Rahul Gandhi: 5 crore families and 25 crore people will directly benefit from this scheme. All calculations have been done. There is no such scheme anywhere else in the world. Congress president Rahul Gandhi Monday said that 20 per cent of India's most poor families will get yearly 72,000 rupees in their bank accounts under minimum basic income guarantee scheme if the party comes to power at the Centre after the Lok Sabha elections. Congress Monday announced the candidature of Sachin Choudhary from Amroha Parliamentary constituency in Uttar Pradesh. Choudhary will replace veteran leader Rashid Alvi from the seat. The Supreme Court Monday asked the Election Commission to reply if it has any difficulty if court orders increase in the number of random VVPAT audits. Currently only one per assembly segment is audited. A bench headed by CJI Ranjan Gogoi was hearing plea by 21 political parties seeking direction to EC to randomly verify the Voter Verifiable Paper Audit Trail (VVPAT) in atleast 50 percent Electronic Voting Machines (EVMs) during elections. The top court will hear the matter on on April 1. CJI asked the appearing EC official if the Commission can on its own increase the number of VVPAT’s that are randomly verified, adding "we would like you to increase”. In reply, the EC official said there was no requirement to increase the count and that it was taking periodic steps to strengthen the poll process. The bench was not happy and asked why then the apex court had to intervene to introduce the VVPAT machines. CJI also tells the EC official that “no institution including the judiciary should insulate itself from suggestions”. National Congress (NC) leader Farookh Abdullah Monday filed the nomination papers for the Lok Sabha elections. Abdullah is contesting from the Srinagar constituency in Jammu and Kashmir. Lok Sabha elections 2019 LIVE: Monday is the last day of filing nominations for the first phase of Lok Sabha elections. In the first phase, elections will be held for all 25 Lok Sabha seats in Andhra Pradesh, and 17 in Telangana. Other constituencies going to polls in the first phase are Uttar Pradesh (8); Maharashtra (7), Uttarakhand (5), Assam (5), Bihar (4), Odisha (4); Jammu and Kashmir (2), Arunachal Pradesh (2), Meghalaya (2), West Bengal (2), and Chhattisgarh (1), Manipur (1), Mizoram (1), Nagaland (1), Tripura (1), Sikkim (1), Andaman and Nicobar Islands (1) and Lakshadweep (1). On Sunday, the BJP released its seventh list of candidates for the upcoming general elections. The BJP, which had earlier announced candidates for five out of the 11 Lok Sabha seats in Chhattisgarh, announced its nominees for the remaining six seats on Sunday. Last week, the party had announced that they would change every single sitting MP in the wake of a loss in the Assembly elections despite winning 10 out of 11 seats in the 2014 parliamentary elections. This was confirmed on Sunday evening. Replacing eight-time MP Ramesh Bais, the BJP fielded former mayor Sunil Soni in Raipur. Soni will be up against Pramod Dubey, the current mayor of Raipur who has got a Congress ticket. Abhishek Singh, son of three-time Chief Minister Raman Singh, has been replaced in Rajnandgaon by state general secretary Santosh Pandey. Meanwhile, the Congress also released its 9th list on Sunday. The grand-old-party fielded veteran leader and Rajya Sabha MP B K Hariprasad from Bangalore South, Tariq Anwar from Katihar and renominated P Chidambaram’s son Karti Chidambaram from Sivaganga in Tamil Nadu. The party, however, remained silent on whether its president Rahul Gandhi would contest from a second seat — in South India. Senior Congress leader P C Chacko said he believed that Rahul has so far not responded favourably to the demand for contesting from Wayanad seat in Kerala to anyone.